This entry was posted on Friday, March 6th, 2015 at 12:00 pm and is filed under News/Announcements, Posts. This post was originally published by By Cindy Wooden of Catholic News Service on February 3, 2015. 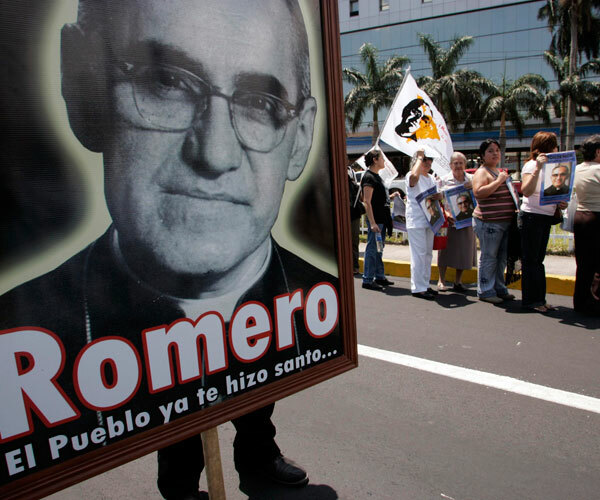 After decades of debate within the church, Pope Francis formally recognized that Salvadoran Archbishop Oscar Romero was killed “in hatred of the faith” and not for purely political reasons. Pope Francis signed the decree Feb. 3, recognizing as martyrdom the March 24, 1980, assassination of Archbishop Romero in a San Salvador hospital chapel as he celebrated Mass. The decree clears the way for the beatification of Archbishop Romero. The postulator or chief promoter of his sainthood cause, Archbishop Vincenzo Paglia, president of the Pontifical Council for the Family, was scheduled to brief the press Feb. 4 about the cause. Archbishop Romero’s sainthood cause was opened at the Vatican in 1993, but was delayed for years as the Congregation for the Doctrine of the Faith studied his writings, amid wider debate over whether he had been killed for his faith or for taking political positions against Salvadoran government and against the death squads that were operating in his country. As head of the San Salvadoran Archdiocese from 1977 until his death, his preaching grew increasingly strident in defense of the country’s poor and oppressed. During his general audience Jan. 7, Pope Francis quoted words that Archbishop Romero had spoken at the funeral Mass of a priest assassinated by Salvadoran death squads: “We must all be willing to die for our faith even if the Lord does not grant us this honor.” Although not seen as exercising any pressure to move the cause forward, St. John Paul II made it a point of praying at Archbishop Romero’s tomb in the San Salvador cathedral during visits to the city in 1983 and again in 1996. When Pope John Paul returned 13 years later, he told the people that he wanted to pray again at the tomb of Archbishop Romero, “brutally assassinated while he offered the sacrifice of the Mass.” The pope said he was pleased that the archbishop’s memory “continues to live among you.” An official decree of martyrdom removes the beatification requirement of a miracle attributed to the candidate’s intercession. Generally, a miracle after beatification would still be needed for canonization. The same day that Pope Francis formally recognized Archbishop Romero’s martyrdom, he also signed a decree recognizing the martyrdom of two Polish Conventual Franciscans and an Italian missionary priest who were murdered by Shining Path guerrillas in Peru in 1991. Franciscan Fathers Michal Tomaszek and Zbigniew Strzalkowski and Father Alessandro Dordi, a diocesan priest from Bergamo, were killed in separate incidents in August 1991. Dates for the beatification of Archbishop Romero and the Peru martyrs were not announced immediately.